Nasa's New Horizons spacecraft flew by the 35km-long world on 1 January at a distance of 3,500km. It's made up of two distinct pieces that once orbited each other before colliding at a gentle speed, team members told a major US conference. The scientists may also be close to understanding why it's flattened like a pancake, rather than spherical. "We have never seen a pristine binary like this anywhere in the Solar System," said Prof Alan Stern, the mission's principal investigator from the Southwest Research Institute in San Antonio, Texas. "We have seen bi-lobe comets, but we were never sure when we were looking at those whether it was something that was born with that shape or evolved to that shape. "Theoretical models of planetesimal and planet formation predicted that objects like this should be out there. And the very first Kuiper Belt planetesimal that we visit turns out to be one of them... you can't get luckier than that. Unless they're very common." Jeff Moore noted that the lumpy shape of Ultima could be a legacy of its accretion from these objects, describing them as "poorly formed snowmen", referring to the original nickname for the object. It's a "time machine, taking us back to almost the very beginning of the Solar System". "If you go back to the solar nebula, the gas and dust that's circling the Sun, there are modern theories that postulate overdense particle or pebble concentrations that can gravitationally merge together - large swarms that can form bodies on the scale of Ultima Thule," he said. "As these particles come together, they will naturally form binaries." 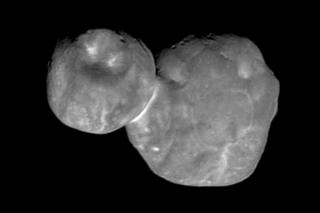 Ultima and Thule "almost certainly formed in the same location", said Prof Stern. "We know this because, otherwise, they would have collided at a higher speed, had their orbits been very different." Computer simulations suggest that the objects collided at a speed of just 2-3m/s, as team member Kirby Runyon explained: "About the speed you might run into a wall." In addition, the long and short axes - the imaginary lines running through the objects at planes perpendicular to one another - are remarkably well-aligned for both Ultima and Thule. "It is very improbable that this would arise completely by chance," said Prof McKinnon. "The implication is that these bodies were almost certainly in orbit around one another." We might also be edging closer to an explanation for the object's striking flattened shape. Prof McKinnon drew comparisons with Atlas, a moon of Saturn that orbits within the giant planet's ring system. "This is an accretionary environment - this satellite is accreting particles. Those particles just happen to be small," he explained. This suggested there might be a link between the conditions that shaped Atlas in Saturn's ring system and those in the rotating mass of rocky material that eventually formed the lobes of Ultima Thule. "A flat thing can be flat because it was originally weak and was spinning rapidly, but then it gets a little stronger," Prof McKinnon told BBC News. But he added: "We actually don't know. That's one of the more complicated and mysterious aspects to this - why this thing is as flat as it is." Prof Stern said New Horizons still had fuel left and it's possible the mission might even get an extension from Nasa to try to target another object in the Kuiper Belt. He told BBC News: "It really depends on how the senior review ranks our proposal because the missions are set to compete with one another. I think we have done a spectacular job, both at Pluto and Ultima Thule, not only in terms of execution, but in terms of advancing the field.